After having built my first shirt-pocket transceiver about a year ago I occasionally thought of how this or a more or less modified design could be made simpler to save components and therefore limit space as well as reducing the complexity of the whole rig. This was due to the fact that I thought that the ancestor (see link above!) of this project was somehow „overkill“ because I used plenty of stages redundantly that could have been used for receive and transmit operation. Cabinet size is about 10 by 4 by 5.5 centimeters which equals to a volume of 220 cubic centimeters (cm³). Making it more simple without detereorating the performance? SP5AHT’s circuit uses one mixer (US2 in the schematic) to serve as the receive mixer during rx periods and for the balanced modulator when on transmit. Then the resulting signal is fed through the filter and subsequently processed by mixer 2 (US3). This mixer works as the product detector on receive mode and as transmit mixer when you are on the air. The two oscillators (VFO and LO) are fed to the respective mixer depending on the current operation. This is done by a simple relay connected to the PTT. So when changing from receive to transmit the two oscillators are swapped thus changing the complete function of the circuit. 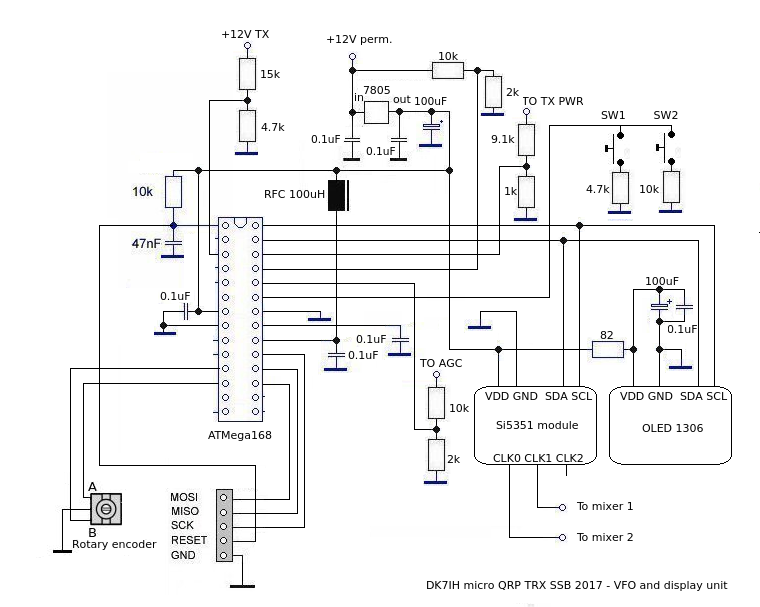 To get rid of the relay and because I wanted to use the Si5351A clock oscillator chip, my idea was making two of the 3 oscillators present in the clock chip act as LO and VFO. By software, when switching from rx to tx, these oscillators’ frequencies are simply swapped. The microcontroller driving the Si5351A reads the PTT and when pressed to talk the frequencies present on CLK0 and CLK1 are put out reversely. Thus no hardware switching is required. In addition the audio amps in the end of the receiver chain are powered off. 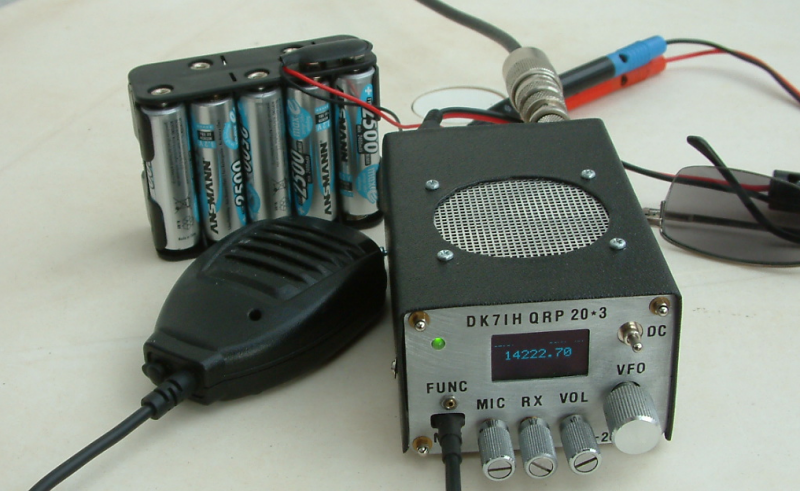 Instead of this the rf power amp of the transmitter section is connected to +12V DC as well as the microphone amp. The antenna relay disconnects the receiver front end from the antenna line and connects the antenna to the LPF that is installed after the rf power transformer of the rf power amp final stage. 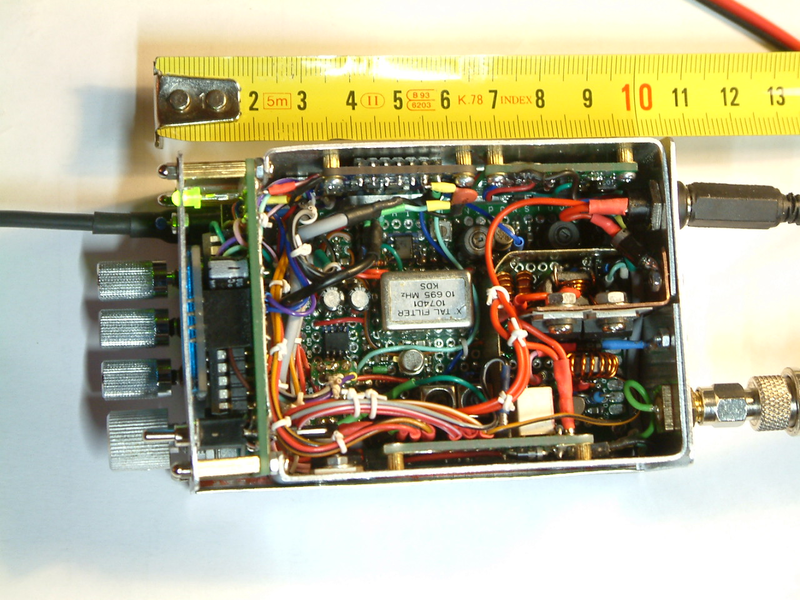 By this the whole transceiver is constructed much simpler and lots of circuitry has been removed from the rig. Circuit explanation: During receive periods the signal is fed into the antenna jack whose line is switched by the antenna relay and fed to the first band pass filter for 14MHz when listening to the band. Afterwards it is amplified by a dual-gate MOSFET transistor that is connected to the AGC line that reduces gain when strong signals are detected. The next stage is mixer 1 where a VFO signal of about 24 MHz comes from CLK0 of the Si5351A module. The result of this mixing process is the IF of about 9 or 10.7 MHz or whatever frequency you are about to use depending on the filter you have installed. This signal is amplified by another dual-gate MOSFET. On receive mode this stage is also under AGC control. When transmitting it is powered to full gain of about 18dB applying +12V via a 2:1 voltage divider consisting of 2 resistors with 82k each. 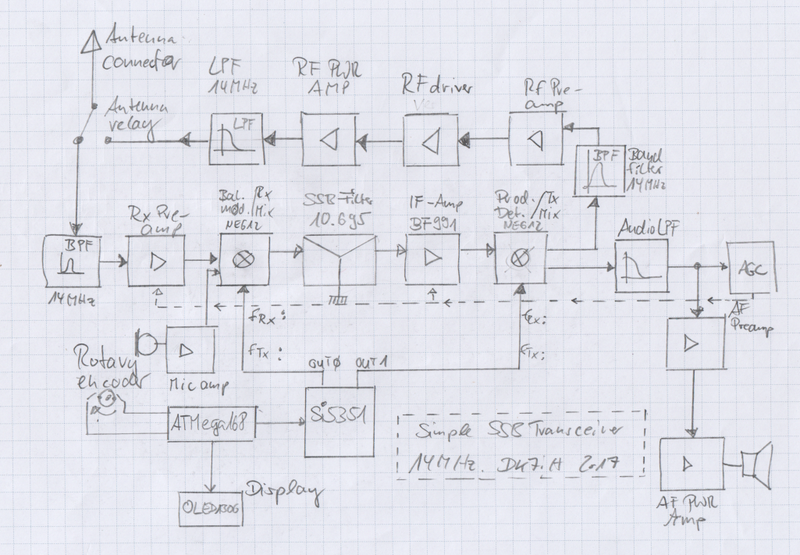 Next step is mixer 2 where the IF signal is mixed with a 9 resp. 10.7 MHz LO signal (receive mode serving a product detector) or with the VFO signal in mixer 2 serving as tx mixer. On receive two audio stages (a preamp with LPF in advance and a power amp) amplify the audio signal to a level that can be fed into an 8 Ohm loudspeaker. 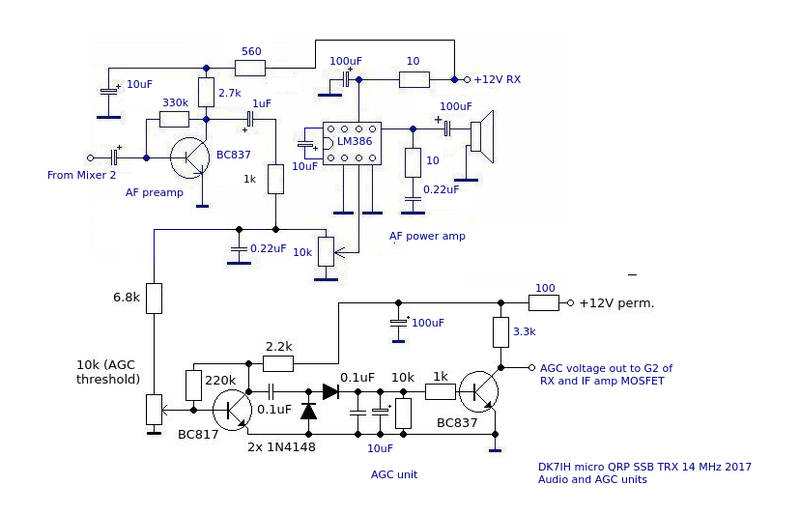 On transmit a BPF eliminates the unwanted mixing products and a three stage rf power amplifier lifts the signal to a power level of 3 watts peak power. Starting from left side top there is the first receiver amplifier stage using a dual-gate MOSFET. The use of a MOSFET transistor ensures that the noise figure and sensitivity of the whole receive improve very much. The stage is comnnected to the AGC chain. The dc voltage applied by the AGC section varies in the range from 0 to 6 V DC. In addition it can be set by hand by turning a front panel mounted potentiometer that alters the DC voltage in the range from 0 volts to max. volts from the ADC section. The input is a single tuned circuit using 4 (antenna side) by 16 turns (MOSFET gate side) on a TOKO 5,5 mm coil former. Parallel capacity is 47 pF. In drain line of the transistor the same filter is used coupling the signal to the first mixer (NE612). Note that the second filter is reversed (secondary in drain line) to avoid self-oscillation of the preamp stage. This mixer’s signal is fed with 2 different input signals (antenna or microphone) and with 2 different oscillator frequencies: about 24 MHz on receive mode or 10.695 +/- 1.5 kHz depending on sideband used when on transmit. The resulting interfrequency signal is fed into an SSB filter which is terminated by 2 resistors of 1k each side to ensure proper impedance matching. Next stage is the interfrequency amplifier which is the same circuit like the receiver’s preamplifier. This one is also connected to the AGC’s DC line. On transmit mode with no AF signal on the AGC present this stage runs on full gain. The chain is completed by the second mixer serving as product detector on receive and as tx mixer when going “on the air”. This section also is no “rocket science”. A simple preamplifier using a bipolar transistor (BC846) in common emitter mode, a low pass filter (R=1k and C=0.22uF) and an LM 386 amplify the resulting af sig to an adequate volume to listen to the sound even in an environment that is not 100% noise free. 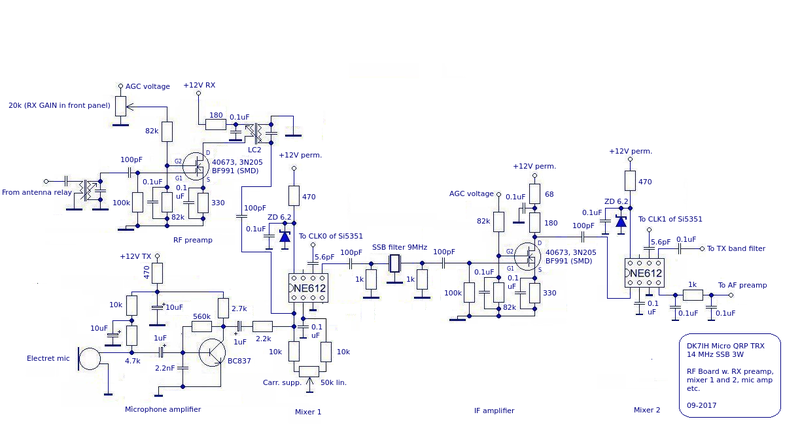 This is a circuit I have built several times and it’s capable of delivering up to 5 watts of rf power. In this transmitter I’m not driving it beyond 3 watts which is suffice to establish connections on the 20 meter band worldwide a well performing antenna provided. Emitter degeneration and negative feedback are present in preamp and driver stage to ensure maximum linearity. Both stages are operated in class A mode. The final stage works as a push-pull stage using class AB. Push-pull mode eliminates even order harmonics by circuit feature. A heatsink is mandatory for the final stage (the mounting frame in my case) and at least recommended for the driver. The values for the broadband transformers are stated in the schematic above. This one is equipped with the clock oscillator chip Si5351A by Silicon Labs. I use it mounted to the well known Adafruit breakout board that can handle 5 volts even if the chip is designed for 3.3V. So, this board is compatible to standard microcontrollers like the ATmega168 that is applied in my transceiver. The display is the 1306 chipset based OLED that is also designed for 5 volts supply voltage. Both, the Si5351 and the OLED are designed for I²C-interface which is called “Two Wire Interface” (TWI) in Atmel’s language. The major advantage this interface has got is that only 2 control lines are required, one of them clock (SCL) and the other data line (SDA) to transfer data to the respective units. Basically you need two pull up resistors to tie these lines to +5VDD but I use the internal pull-up resistors in the Atmega168’s ports that do the job well. Problem to be mentioned: When testing the early version of the receiver I found the OLED to be very noisy. After a brief research I realized that the signals that were audible in the receiver traveled on the VDD line. Thus I inserted an 82R series resistor and a set of blocking capacitors in the place which made the noise fully disappear. The main board of the transceiver is made of a 5 by 7 cm breadboard with double-sided soldering pads each connected by a small tubing electrically connecting the both sides of the pad . This is a big advantage when you solder SMD components because you can setup the circuit on both sides of the board and save a lot of space. NExt is that it is nearly impossible to dissolder the pads even if you are resoldering the spots many times. The reason: The soldering pads are rivets anchored on both sides of the carrier of the board. On the left you can see the front panel with the controls, behind the panel the OLED and then the main rf board. The Si5351 is mounted vertically on top left from the AGC board. Underneath there is the receiver’s front end (hidden by the red power supply cable). On the right I sited the power transmitter, at the bottom there is the relay for tx/rx switching. All is built into a 9 * 5.5 * 4 cm Aluminum frame. Operating is really fun with this micro transceiver. Since the finishing of the transceiver 4 weeks ago I was on air daily. 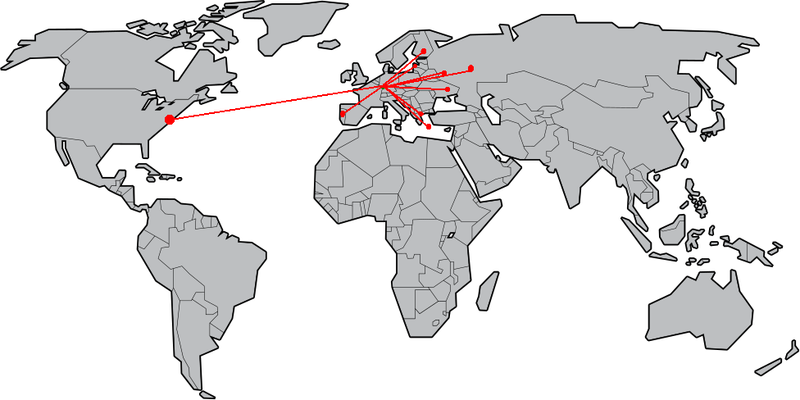 Here are some regions of the world I could establish successful contacts with. Antenna is a Delta Loop fed in on upper corner about 12 meters above ground. Hi Peter. How about the atmega code? This could be used to another bands? is there a reason why you don’t use both ends of the LC2 transformer to supply the NE612 with a balanced input signal? I think this would improve performance by a lot. 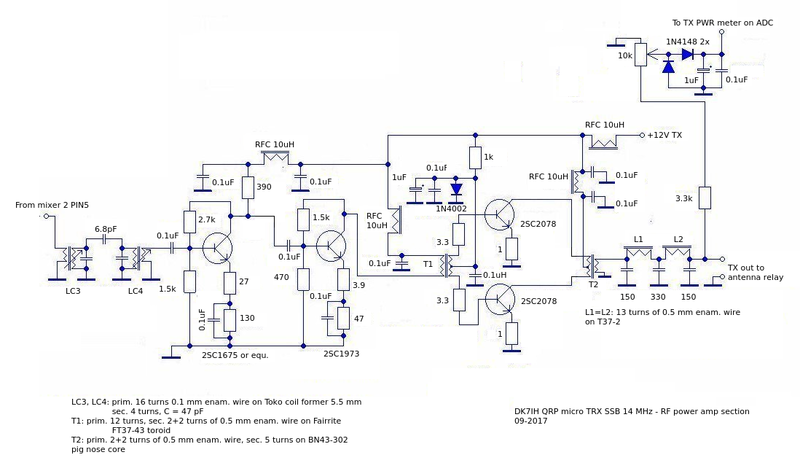 I have tried a symmetrical coupling in a former transceiver and compared it to the unbalanced. I could not find a significant difference in performance if either. And in this special case putting the “cold” end to PIN2 of NE602 would interfere with the balancer circuit of the SSB modulator if not coupled with a C e. g. 100pF. To keep the circuit simple I did not try this. Just in time, I have been working on a very similar project lately-inspired by your 5-band transceiver project and now this one! I had been planning on using an H-mode mixer for the RX/TX first mixer, and an MC1496 for the modulator and demodulator. I have picked up a few KVG filters, and am planning for both AM and SSB modulation modes. The big holdup so far has been the RF amplifier, and the ATmega128 control board. I look forward to seeing what you come up with! Wow, another great little design! You must have a lifetime supply of 40673’s, they are getting hard to find! I have some MFE130’s that might sub, or I could use a J310/2N3904 combo as in the ‘hybrid cascode’ circuit. I also have some MC1350’s for the IF stage. This dual mixer with switched oscillators is a very similar circuit to the one by W3TLN in the ‘single sideband for the radio amateur’ book from the ’60’s. He used different mixers for the RX and Bal mod, which I might try as the NE612 overloads very easily in the RX, but is fine elsewhere. well, I bought a large bunch of 40673s from a German vendor some years before who is specialized in selling NOS material (http://www.pollin.de) 😉 But nowadays I have switched to BF991 or BF 998 in SMD package. They are easily to be obtained by ebay vendors or elsewhere. (e. g. Mouser has them on stock). For amplification purposes some hams use BF1009, which is a pre-biased tetrode. Due to the internal bias this one is not suitable as a mixer and I don’t have any experience with them. But as an amplifier it should be fine, like hams say. Mouser has the BF998E6327 in stock. It’s a 30 volt ‘tetrode’ mosfet with DS voltage of 30. Price is $0.35 US if you buy 10 at a go. Looks good, I’ll have to order some! The BF991 is listed as ‘obsolete’, I only found one hit from a UK ebay seller, for about $10! I have also seen lots of the 5v pre-biased amplifier tetrode mosfets listed. All of these are UHF devices (1GHZ or more), they might need some TLC to keep from oscillating in HF amps. The 5v devices would require changing the AVC circuits for sure! I’ll be following your projects for sure. Hi John! I have seen that you have posted my website URL to a ham radio forum from the Netherlands. Dank u wel! Best wishes to you and all the other readers having commented recently to this blog! Peter, just found your project and it is superb. I was taking yesterday about trying to do something like this. Reversing the frequencies on two si5351 clocks is an elegant idea that would not have been possible until this remarkable clock gen IC became available. The ‘architecture’ (and parts count) of the radio becomes ultra-simple, ideal for an ultra-compact rig. Armed with the PCBs, it seems you could build one of these in a few nights. My Arduino script includes a number of control/CW/keyer functions that I am loathe to sacrifice, so I’d like to have a go at the more conventional 2 x SA612 pattern, in which the VFO-to-mixer association is fixed. But it would be well worth hacking out a custom script to evaluate this scheme. Well done!